Marinas CAN help in the fight against the spread of invasive species. The DEC has some incredible resources and information on invasive species management. This printable is great for marinas to have on hand as their customers begin to enjoy their summers out on the water. 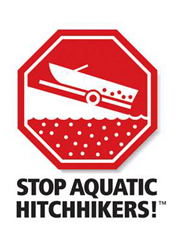 The most effective method to ensure that no invasive species or fish diseases are transported to a new body of water is to completely dry your boating and fishing equipment. The key is to make certain that equipment is COMPLETELY dry before using it in a new water body. Drying times vary significantly depending upon the type of equipment, air temperature and relative humidity. While the outside of a boat will dry relatively rapidly, bilge, live wells and other areas of a boat not reached by the sun or lacking good air circulation will take additional time to dry completely. A minimum of 5-7 days drying time in dry, warm conditions is recommended. Drying times can be estimated at http://www.100thmeridian.org/Emersion.asp (leaving DEC website).